One thing I love, which used to be something I completely avoided, is having a great circle of friends. Although I may not see or speak to some of these friends on a regular basis, they are friends who put a smile on my face just by thinking of them. They have that aura about them that makes you know instantly they are the kind of people you will remember your whole life. I find I make a lot of friend cards probably because I know that they will come in really handy. You would think with the amount of family I have I would make more birthday cards but to be honest, there are so many people that I easily forget birthdays. Today I am sharing a friend card with you. This new set called Vintage Vogue from the Occasions Mini is super fabulous. I stamped my Friends sentiment in Chocolate Chip ink on Whisper White cardstock. Then, because I loved the shape of the rubber cling mount that it is made from, I layed my stamp over top of my image and made the outline on my cardstock with a pencil. Next I cut out my sentiment and had those beautiful curves from the stamp. To make it stand out though I inked the edges with Regal Rose ink. Next on a separate piece of White cardstock, I stamped my flourishes in Old Olive ink. I cut this out using my circle scissor plus and layered this on a scallop circle of Chocolate Chip ink. I cut this out using my Scallop Circles #2 BigZ die. I added a bit of paper piercing around the edge of the circle for a bit more dimension and popped up my sentiment on my flourish circle using pop dots. Finally using pop dots, I attached these layers to my card front. 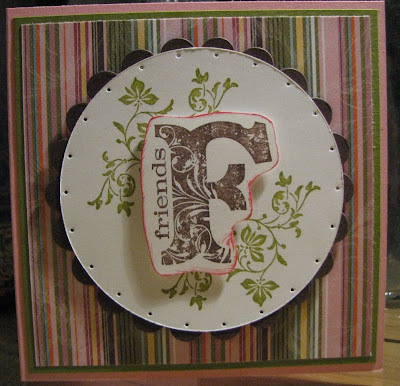 I created the card front by layering Sweet Pea DP onto a layer of Old Olive, which is layered onto the 4.25" square card base made from Pretty in Pink cardstock.